Being proactive, looking to the future and having a long-term strategy are all good things, but while thinking ahead is of enormous use to brands, so is reacting quickly to events that have just happened. 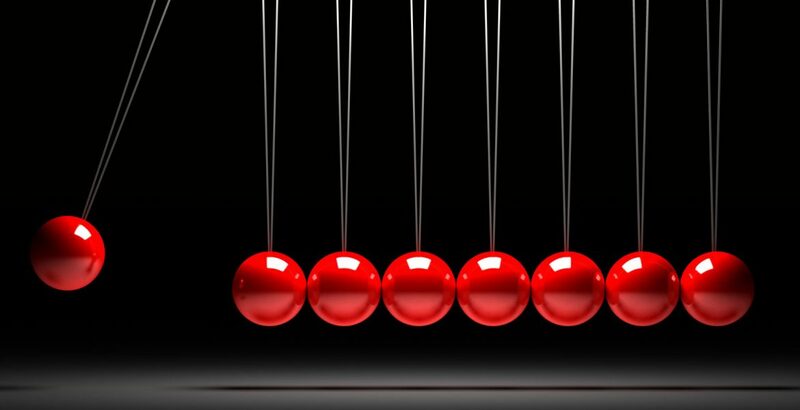 For every action, there is an equal and opposite reaction, according to Newton’s Third Law. Smart creativity has used this for decades and as the project timelines get shorter and shorter, maybe it’s worth a look at three ways in which this can help us find great ideas, fast. Apparently this was Harold Macmillan’s answer, when asked what was most likely to blow governments off course. Some things never change, clearly. But what might be troublesome for politicians can be great for creativity. Some of the best campaigns of recent years have been in reaction to events, be they political, sporting or cultural, rather than the product of a year’s planning. They resonate because they engage with people on issues they already care about. In a sector that is increasingly obsessed with brand purpose, reactive campaigns touch on important issues right after they happen. As such, they’re tailor made for social media virality. At the start of 2019, The North Face ran a simple, black and white image campaign across its social channels focused on the message ‘walls are made for climbing’. Not really a shock coming from a company that sells outdoor sportswear. But North Face’s timing was perfect, launching the very same day that President Donald Trump had decided against declaring a national emergency to force through his planned border wall. Leaving aside the potentially negative repercussions of making a political statement, the post received about twice as many likes, tweets and comments on social media as an average post by The North Face would. And even if one was to worry about the effects of aligning with one side or another, the continuing rise in both sales and share price for Nike post-Kaepernick seems to have clarified that, done in a way that fits the brand, reacting to a big or provocative event can pay off big time. People who say “let’s turn this problem into an opportunity” can be a bit annoying, but they also tend to be right. For brands, there’s definitely a reactive creative opportunity in the ‘big fix’: honestly acknowledging the problem (not trying to sweep it under the carpet) and going out of your way to resolve it. Consider KFC’s reaction to running out of chicken last year. Failings in its supply chain meant that hundreds of its stores were out of stock and had to close. On cue, Twitter spun into overdrive with criticism of the brand. But many of those people were soon back to commend them on how funny its apology message was. In the Sun and Metro, it ran full page ads with an empty KFC bucket and the anagrammatic ‘FCK’ — no doubt a nod to Trevor Beattie’s classic FCUK. The ads blew up, winning not only buckets of awards, but demonstrating an acute sense of self awareness, humour, and the savvy to react. Nothing brings people together like a common enemy. United in a cause, we feel inspired, uplifted, perhaps a little outraged as – best of all – we stand shoulder to shoulder with the brand that has cleverly recruited us to its purpose. Then, after Serena was publicly criticized for calling an umpire a liar in the US open and in the face of mounting evidence of gender inequality, Nike went a stage further, confronting the world with the craziness of perceived limitations and prejudicial attitudes, then inspiring women to show the world what crazy can do. The best creative work has always been a marriage of the unexpected, yet relevant. Over the last few years, these two factors have become extremes at the opposite ends of great pendulum swings in our industry. With very few exceptions (Barclaycard Crystals, Moneysupermarket Action Men), it can feel like the gloriously unexpected is losing to the boring predictability of relevance and retargeting – and our place in culture is suffering as a result. Since by nature they’re often unpredictable, reacting to events, problems and collective enemies offers a way of being topically relevant and creatively unexpected at the same time, without resorting to playing some lame lifestyle observation back to people, under the guise of an insight. What’s more, as the volume of content that audiences are bombarded with grows, a witty and relevant remark can deliver that ever so sought after ‘cut through’ that brands chase. It catches people off guard. It is genuine and evocative. Perhaps most importantly, it can create a reason for someone to empathise and relate to your brand. And let’s not forget fun; that vital component of creativity and, if we’re honest, one of the main reasons we got into this job in the first place. A reactive brief with a short timeframe forces us to go with our gut and find an idea we’re passionate about, rather than over-strategising, over-working or killing it with a thousand cuts. What is crucial for brands to remember is that the issues you choose must be authentic. A reactive campaign will only work if the issue is something that your brand and its fans are certain to care about/ or if it is in response to a mistake, which is what unites The North Face, KFC and Nike campaigns. And let’s face it, it doesn’t look like the supply of unexpected events, problems and enemies is going to run out any time soon. My grown-up career started in market research. It covered almost anything, which was great: packaging, pricing, newspapers, travel, food, drink and especially brands and advertising. I loved it but felt left out when the debrief ended, but the conversations and ideas carried on. So I got a job as a planner, learned the ropes in a couple of agencies and then learned to do it well in some amazing ones. I was lucky enough to be part of some amazing campaigns at Saatchi & Saatchi, BBH and Mother, was a Campaign Face to Watch and won 3 IPA Effectiveness Awards along the way. Then, as the industry began to splinter, I set out to learn in some who specialise in the ‘other stuff’ that my old agencies were trying to get into. I learned PR, Social and Experiential at Cake, Shopper and Ecomm at Geometry and ‘Integrated’ (whatever that is) at Arnold KLP, where I also met some people I definitely wanted to work with again. Now I’m at Twelve, helping to run an agency with quite a few of them, including Melissa and Derek. And, although I’ve become senior and have (and love) a leadership position, I’m still a planner at heart. Because finding interesting things in anything that comes in the door, is the best job there is. I’ve always looked for things that are interesting and I think that’s why I do what I do.I’ve been a milkman, a hitch-hiker, a waiter in a curry house and I once won a turkey in a fishing competition.